After the purchase of your new cushions, getting a place to store them when not in use is a good idea. Look at some of my storage solutions for help in this area here. Now let us look at some of the styles and sizes of the patio cushions that are available today and see if any of this will fit your requirements. Your type of seating will determine the type of cushion you will need. Measure your cushions for the correct size, you will need the width, length and thickness. Make a note of where folds and seams are. Ask yourself what kind of seating does the cushions fit, chair, bench or lounger. 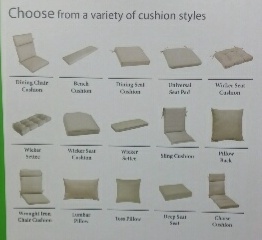 Use the picture here to determine the type of replacement cushion will work for your outdoor furniture. Many colors and designs are available. You will be the one to determine the one that matches the decor in your outdoor space. If just want to change your decor with cushion colors, replacement cushions can give you several looks for your outdoor space. 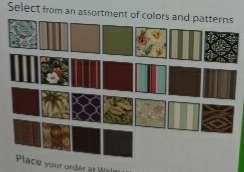 If you are looking for solid colors, flowers, stripes or designs in your replacement cushions Walmart.com will have a design for you. Use the pictures here to determine what will work best for you. 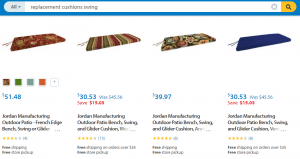 My method for finding the correct replacement cushions is to go to Walmart.com, type in replacement cushions with the style of cushions. This will bring up the different colors and styles for the cushions you are looking for. See the screen shot for an example of one of my searches for an example. The biggest problem with outdoor furniture cushions is the sun and rain. While cushions are made to sit in the outdoor weather, sustained sunshine and staying wet will shorten the life of your cushions. Having a storage options is the first thing to look at when purchasing your cushions. I have several outdoor storage solutions here. Making sure that they are out of the weather during long periods of inactivity will ensure the next time you are ready to entertain outside your cushions will be ready. Cleaning cushions should only be done with a mild soap and water. Any bleach product or aggressive soap will damage the surface of the material or the stuffing. Making sure that the cushions get fully dried after a rain or cleaning will also extend the life of your cushions. When your current cushions are starting to look ragged, you will need to look for replacement cushions for your patio furniture. Most furniture frames will out last several sets of cushions with proper care. Replacing your cushions for a new look will give you that brand new look without the price of a whole new set of outdoor furniture. I have more replacement cushion solutions here. I hope that you have found this information helpful, if you still have questions or comments for me use the forms below. Know someone that has cushions that look like they are on the way to the trash, share this article on your social networks. I have some really pretty cushions I bought this year for my chairs. I take them in nightly (probably a little overboard) and place them on one of the beds as a decoration. It actually looks really nice. This way they keep their color and fluffiness. Plus, my two sweet dogs don’t use them as a bed. I didn’t know that WalMart had so many choices as far as cushions go. Next time I will shop them instead. I am sure I would have saved quite a bit going that route! Walmart has a great variety of styles and colors to choose from. Most people do not take their cushions in or have someplace to store them out of the weather. They will only last a few years if not taken care of properly. Having good pricing is the other advantage of getting your cushions at Walmart. This reminds me of my grandfather who had impeccable cushions. Every year we would go to his home for a bbq and he was right in the middle of taking his cushions out of the basement where they were stored. My first experience with outdoor cushions wasn’t as great as his. They just weren’t a priority and the winter left all of them flat. Anyways, I never thought about wal-mart as a place to get replacement cushions and just wanted to say I appreciate this post. A lot of cushions get left out over the winter. I would have a place to store them when ever they are not in use, even during the summer like your grandfather, sometimes us old guys know stuff. Having some deck storage container would work also during the summer months, then you would not have to go to the basement. Timely article, We use a plastic outdoor storage chest for our cushions, so I am hoping/fairly confident they made it through the winter, will have to check soon. But this also great for if you want to change up the design of your patio furniture. Some do have different designs on the other side, you can flip them over for a new look. I like this as you can change up the decor without purchasing extra cushions. You are right of course. Every winter I tell myself that I will bring the cushions inside and store them away so that they don’t get rained on an full of mildew etc. Of course that never happens and then they all end up with mould everywhere and I don’t want to sit on them anymore and I need to get new cushions. Thanks for these great tips. Getting some storage for your deck or patio would help some. You would not have to take cushions very far to store them out of the weather. I use sling material in some of my outdoor sitting pieces, they do not require cushions. This is a very helpful article, John, and I appreciate your showing the various shapes. That helps a lot. Not all cushions have the same shape or thickness. Getting the correct ones the first time is often not done. I am happy to have found this article before I need it. I am trying to plan an outdoor space and will want chairs with cushions. I like a soft place to sit. I will also be looking at your care of outdoor cushions so I can extend their use as long as possible. Having the proper storage for your cushions should be high on your list. Storing them when not in use will extend their life in the outdoor environment. Hey John, this is just the ticket, our cushions are now beyond using again, they did last 5 years though without to much care, or should I say no care except for storing them in the winter. Maybe this time we will get some sort of patio storage for them to keep them looking new. Some sort of decorative patio storage should be in your future. I have some storage solutions if you follow this link. I have a very old set I purchased from Walmart. The cushions are different sizes on the bench and the chairs. In order to replace them, It would just cost too much. My solution was to purchase material and cover them with new material. They look really nice and I have another year! Great to restore your cushions, they will not outlast most frames today without proper storage. I found this at the perfect time of year…it is finally 80 outside, from the 40’s just a few days ago. I am thinking of outdoor lounging, that’s for sure. And our cushions need to come down from the garage loft and get out there! I agree, John, they can last for a few good years, but then need replacement. Good info. We have pine trees, so we have to put tarps over them during the season…doesn’t look as nice but it does make them usable! The pine trees can leave a little sap on your furniture if not protected, this could lead to a shorter outdoor life. Having a tarp is a good thing for your situation. I’m lucky in that I live in a fairly dry area (often too dry. The biggest affect on the patio cushions is sun bleaching. It’s good to have the references you supplied to replace them. Nice to keep things bright and cheery! Having to deal with the sun is another problem, this will fade the colors quickly. Storing or covering your cushions are a must. I have articles on both methods of keeping your cushions fresher longer. 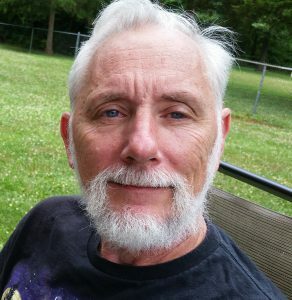 John: Good webpage on replacement cushions for patio furniture. I so happen to store ours in a deck box which I highly recommend getting. Like you point out, I store them in the fall and put them out in the late spring. Extends the life of the cushions. You have a great website on patio furniture and accessories. You are one that is on top of his game. Most will leave the cushions out all year and wonder why they only last two summers. Having a storage solution that matches your outdoor decor is a great solution.